Archive of Radical America magazine, a left-wing journal published in the US 1967-1999. It began life as an official journal of Students for a Democratic Society (SDS) but later became independent. Radical America was founded by members of SDS in 1967. The initial editors were Paul Buhle and Mari Jo Buhle in their graduate school days, operating in Madison, Wisconsin. In the first few years, it served as the "unofficial journal of SDS." Initially, subscriptions were sold at a discount rate to national SDS members. The Buhles relocated to the Boston, Massachusetts area, and brought the journal with them. By the time of the Boston move the journal was independent from the SDS. The journal, published in Somerville, Massachusetts, focused on topical issues of concern to the left and society at large, such as women's liberation and working class radicalism. Beginning in 1970, each issue had a dedicated focus upon one issue. Mainly, during the 1970s, the journal evolved in a direction concerned with New Left issues, rather than traditional, Old Left concern with strengthening ties with trade unions. It was particularly active in the 1970s, as authors related the experiences of feminist activists and autonous work-place activists. Many of the PDF issues here have been taken from this website and we are grateful to Reddebrek for posting them here. And thats the last of the scans uploaded. mate, that's amazing, thank you so much! That was a huge bit of work that we didn't have the time for ourselves, so much appreciated. Thanks, but you should also thank Wojtek for adding the images to most of the early issues. When I tried the images were tiny and enlarging them left them in such a poor resolution you couldn't make them out. Oh and some of the missing issues aren't actually missing. 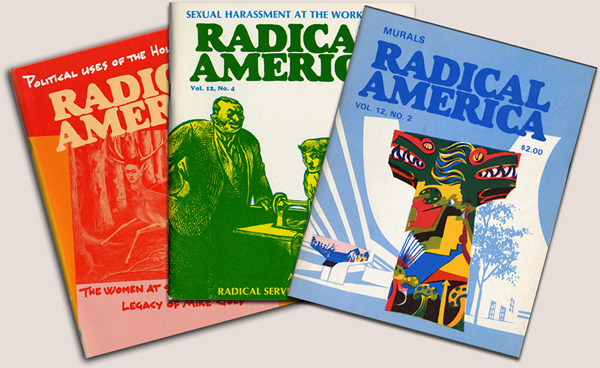 For some reason near the end of its life Radical America would re-issue the last one from the previous volume as issue number one. As far as I know there was no differences between the versions.